Do investors really understand the math behind investment returns? Many investors make their investment decisions based upon emotions like fear and greed. They do not understand the math that drives successful long-term results and why this is important. Understanding the core mathematical principles driving investment returns can help investors make better investment decisions. These core principles are often overlooked, ignored, or misunderstood by investors and will be explored in this paper for the purpose of strengthening the decision-making process. There are a lot of misconceptions among investors as it relates to equity investment returns, hedged equity returns, and the math behind them. The goal of this paper is to establish that certain mathematical principles support the usage of a hedged equity approach over other traditional equity approaches for long-term investment growth. 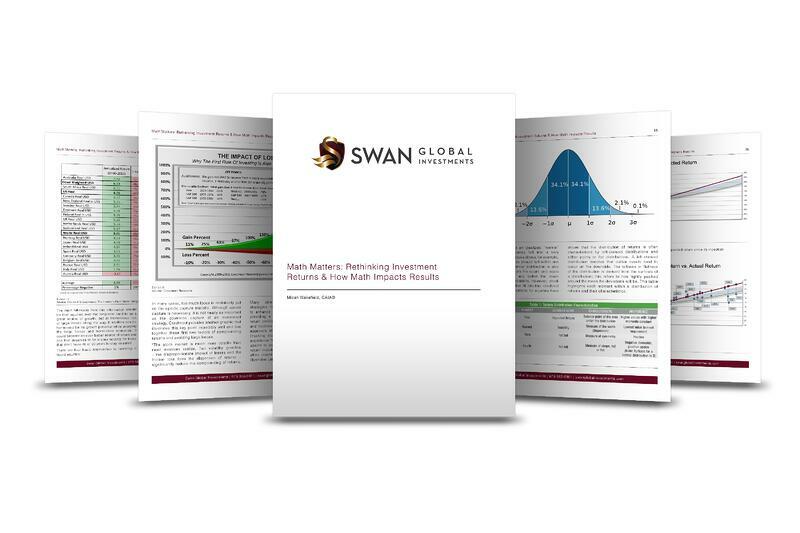 Swan believes it is important that investors have a better understanding of how different equity investments ebb and flow and grow over time in order to properly assess them. Second, many investors familiar with passive or active equity investments sometimes have certain misperceptions regarding the Defined Risk Strategy or other hedged equity strategies. This is mainly because a hedged equity approach generally underperforms during bull markets and tends to outperform in bear markets. The DRS, with its unique approach, requires a full market cycle and is better positioned as a core, long-term holding and not a short-term trading vehicle. Fill out the form below for the white paper.